Sit back and relax at this cozy 3 bedroom 2 bath condo at the Enclave located in Destin, FL. 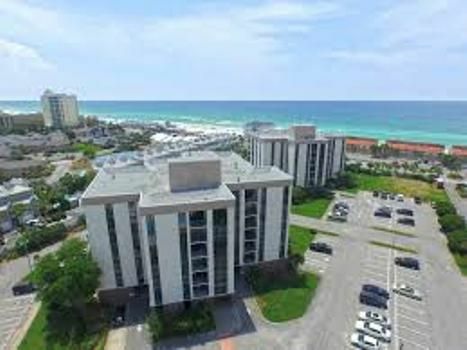 Just steps away from the beach, the Enclave is the best choice for Destin condo rentals! Enclave 505B is very nicely furnished and is perfect for a large family. The coastal decor compliments the beautiful beaches of Destin. The fully stocked kitchen makes cooking a breeze and with a view of the water you will have no problem cooking, The cozy living room offers plenty of plush seating for your whole family to relax after a long day out in the sun. This condo offers a private balcony to sit and relax after a day at the beach. You can enjoy a view of the Gulf of Mexico from your private balcony. The Master Bedroom is spacious and features a nice walk in closet with a large vanity area. The Master bedroom features a private standard master bathroom. One of the fabulous guests bedrooms features double beds with a bathroom shared with the guest room featuring two sets of twin over twin bunks. This room is great for the kids! Take advantage of the spacious condo layout, great location, flat screen TV's, and fully stocked kitchen in Enclave condo 505B. Other amenities include community pool, tennis courts, volleyball court, and outdoor grills. Enclave Destin condo rentals is only minutes away from the best shopping that Destin has to offer! Enclave is only a short walk from the famous Capt Dave's restaurant featuring some of the best seafood in town! You MUST be 25 years old in order to rent from Destin Getaways. I was very satisfied with our stay. Plenty of room for my grandkids. We were not running over each other. Condo was very clean and well equipped. Could use a couple new things but other than that it was great. Will definately be renting again hopefully next year. Manager provided good customer service. We had a wonderful stay with our four kids. What a great layout with tons of space. Short easy walk to beach. Will definitely be staying again! The condo was beautiful and spacious. It really accommodated all of my guests. I was disappointed that the unit did not have a washer and dryer in unit. I probably will not book it again. The condo was very spacious and clean. It's located right across the street from the beach, the pool area is nice, and the customer service was great! We enjoyed our stay.